Posted at: 1/22/2011 07:07:00 PM . Have you ever wondered how easy it is for your personal information to be stolen? Yahoo! Finance has interviewed a former credit card thief who talks about how easy it was to steal your numbers and ways to protect yourself. You said you bought credit card data online. Tell me about that. DeFilippi: Every credit card has magnetic stripe on the back with data on it. There are people out there who hack into computers where that data is being stored. There are also people like waitresses and waiters with handheld skimmers who steal the data that way. Then they sell the data online. I'd pay $10 to $50 for the information from one card. Then I'd use an encoder to put that data on a fake card, go into a store and purchase stuff. It's really scary to think about how easy someone can steal your information. 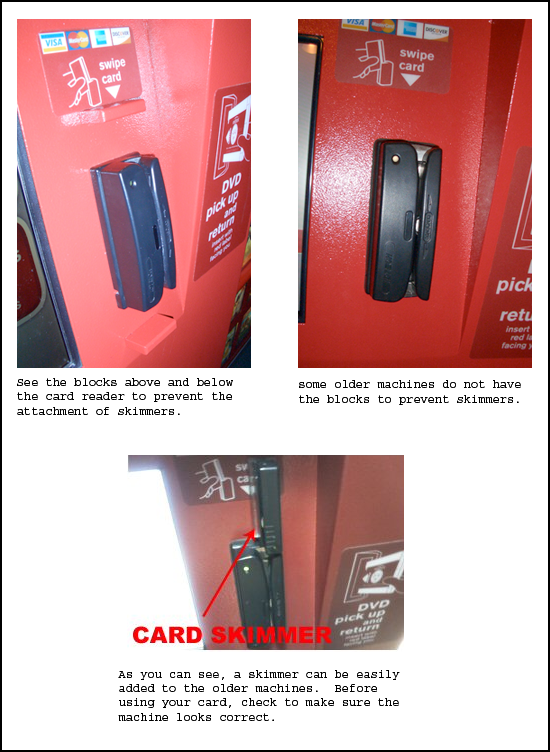 The image below (click for full size view) shows what a skimmer might look like on a Redbox machine. Use this image to try and keep an eye out. If you do notice something funny, inform the business owner so they can get it removed. What's your No. 1 tip on how consumers can protect themselves? DeFilippi: You've probably heard this before, but the most important thing really is to watch your accounts. And I don't mean just checking your statement once a month. If you're only checking your statement once a month, someone can start using your card at the beginning of the billing cycle, and they can do a lot of damage before you catch it. You're talking thousands of dollars, and it will be a lot harder to catch them and dispute it. I use Mint.com, which is a free aggregation service that allows you to put all your accounts on there and monitor everything at once. I check that every day. It's also a good idea to check your credit report at least twice a year to make sure no one has stolen your identity. Legally you can get a free credit report once a year from each of the three providers. I recommend speeding it out to get your reports three times instead of getting three reports at one time. While you might see advertisements on TV for websites like freecreditreport.com, the only government sponsored site is annualcreditreport.com. Read the entire interview at Yahoo! Finance.